Imagine the ultimate DR solution for your radiological department. Imagine the ultimate ergonomic solution that sets new standards for ergonomics, flexibility, comfort and care. Every element and functional aspect has been designed with end users in mind. Through an extensive development collaboration among users, engineers and designers, we have managed to create an X-ray system which combines outstanding technical quality with a unique approach to user friendly design. At heart, is built around the belief that X-ray technology should support professionals – not define their workflow. 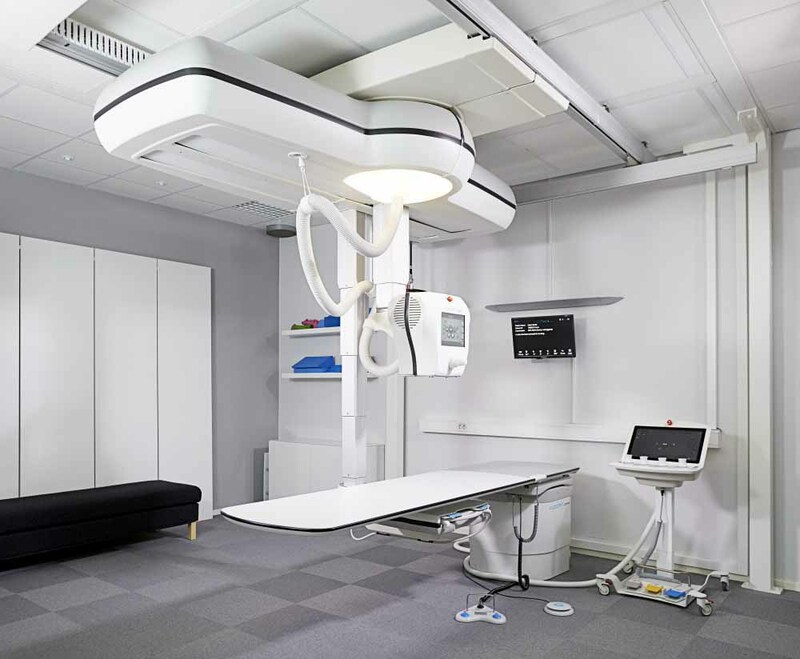 design with the rotating ceiling unit and independently moving X-ray tube and detector arms, allows the system to perform exposures from practically any angle. Position the system Anywhere and experience how examinations such as axial hip and patella skyline exposures are faster, easier and more comfortable to perform on a system that is truly flexible. Use this flexibility to perform exposures on patients who are standing, lying in a patient bed, or sitting in a wheelchair when necessary. With up 999 programmable auto-positions available, preferred positions can be saved and recalled at any time, for fast and fully automatic positioning. provides many ergonomic benefits, simply by virtue of its flexible design. Position Anywhere, you move the system – not the patient. Fully automated movements eliminate the need for staff to manually handle the system, lessening the risk of repetitive stress injuries amongst radiographers. Even manual adjustments are stress free, using the system’s smarthandle and motor-assisted movements. The rotating patient table provides easy access for wheelchairs, patient beds as well as cleaning equipment, providing AccessAnywhere to maximise the space available in the X-ray room. With the latest Canon detectors and imaging software, digital images have never looked better. The intuitive software provides sophisticated image processing for premium diagnostic image quality and the extensive portfolio of high-resolution, docked or wireless and portable detectors ensures you the highest performance in workflow, sensitivity, image quality and versatility.